For a dental plan that's not insurance, check out Brighter.com. Brighter.com is committed to saving customers between 20% and 60% on all dental procedures including orthodontics and specialists. Brighter.com is a great way for individuals and families without dental insurance or facing high deductibles and co-pay to get the dental services and appointments they need, from regular cleanings to root canals and dentures. Simply put, Brighter.com provides members access to low, pre-negotiated prices to over 25,000 dentists nationwide. So if you're looking to pay less for dental care, go to Brighter.com and be sure to get all the latest Brighter.com discounts, Brighter.com promotions, and Brighter.com coupon codes found here at RetailSteal.com. Save 15% off Yearly Individual & Family Dental Plans with this coupon code from Brighter.com. Try Brighter.com for a brighter healthier smile and save between 20% and 60% on dental procedures, including orthodontics and specialists. Click this link to start. Brighter.com has individual plans starting as low as $9 per month. Click here to sign up today and save big on dental work. Sign up for a yearly individual plan versus a monthly individual plan at Brighter.com and save 26%. Click here for access to discounted dental care. Sign up at Brighter.com for an annual family plan starting as low as $129. Plus, there's no enrollment fee. Click here to save on dental care. 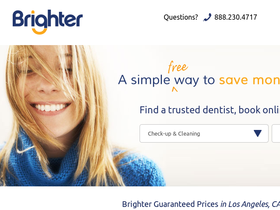 Brighter.com saves members money on dental visits without deductibles or annual limits.